Giuseppe Giaconia first appears in the Painesville, Ohio, area about 1920. In America, Giuseppe Giaconia was known as Joseph Giaconia. Giuseppe Giaconia, son of Filippo Giaconia and Maria Catalana, was born on October 24, 1888, at Terrasini, Sicily. He married Rosina Seggio, daughter of Salvatore Seggio and Carmella Barbera, in 1925. 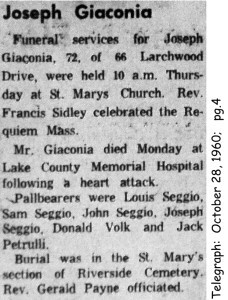 Giuseppe died on October 24, 1960, at Lake County Memorial Hospital, Painesville, Lake County, Ohio, at age 72 of a heart attack. His body was interred at Riverside Cemetery at Painesville, Lake County, Ohio. Giuseppe Giaconia, age 23, immigrated to the United States on May 13, 1912, travelling to Chicago, Cook County, Illinois, joining this brother, Vincenzo Giaconia. Giuseppe Giaconia became a citizen of the United States on March 3, 1941. Giuseppe resided at 519 Storrs Street, Painesville, Lake County, Ohio, when he was naturalized. He was employed by the Diamond Alkali Company, retiring in 1953. 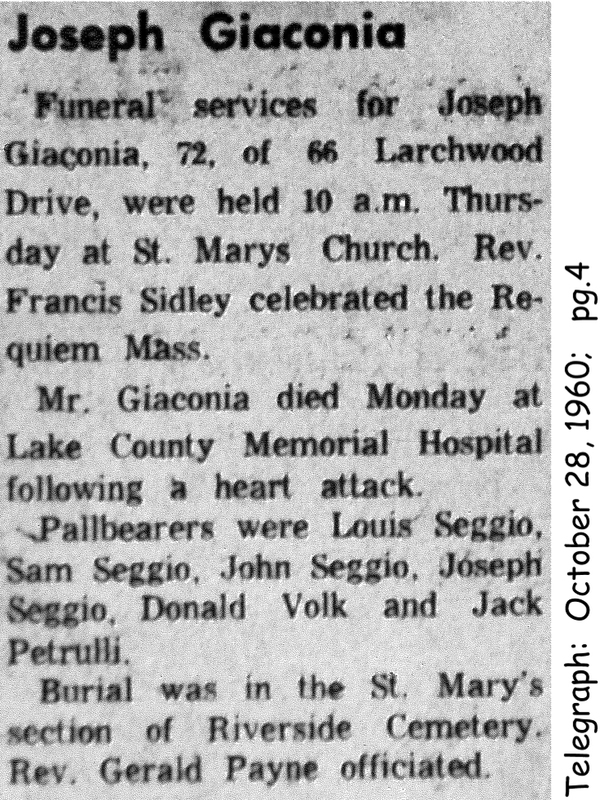 At the time of death, Giuseppe resided at 66 Larchwood Drive, Painesville, Lake County, Ohio. 1. Mary Giaconia was born November 23, 1926. 2. Carmella Giaconia was born in 1929. 3. Philllip Giaconia was born about 1932. 4. Rosemary Giaconia was born in August, 1934. She married James D. Melnyk, son of Michael Melnyk and Pearl Caplinger.